Parental touch reduces children's attention to social threat and increases trust, particularly in socially anxious children. 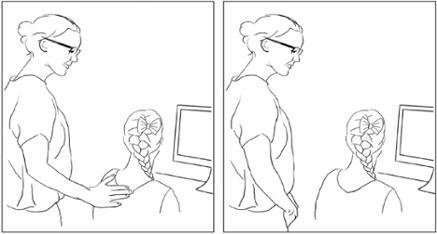 As a result, parental touch may reduce children's social anxiety. These are the conclusions drawn by Eddie Brummelman from University of Amsterdam (UvA) and Peter Bos from Utrecht University (UU) and their colleagues from their research during NEMO Science Live. Their findings have been published as open access in Developmental Cognitive Neuroscience. While parents were waiting in a separate room, the children first completed a questionnaire about their social anxiety levels. Unbeknownst to children, parents were instructed on how to touch or not to touch their child (briefly and gently on the back of the shoulder). The parent went inside, either did or did not touch the child, told the child that he/she was going to work on another computer (see image), and walked over to this computer (in the same room, behind a folding screen, out of the child's sight). The children then completed tasks that measured how threatening they perceived the world around them: how much attention they paid to social threat and how much they trusted other unfamiliar children. "Children who were touched on the shoulder exhibited less implicit attention to threats," says Brummelman. "And while parental touch lowered trust among socially non-anxious children, it raised trust among those who needed it most: socially anxious children." The researchers only observed these effects in children between the ages of eight and 10. "This suggests that parental touch loses its meaning as a safety signal across the transition to adolescence." The findings may be used in the development of new intervention methods. Social anxiety disorder is the most common, yet least often treated, mental disorder in children and young people. "Given that parental touch lowers attention to threats and raises trust in socially anxious children, an important next step is to examine the effects of parental touch on children with a social anxiety disorder," says Bos. "Parental touch may help these children overcome their fear and expose themselves to new situations. We know from previous research that exposure is one of the most effective ways of alleviating social anxiety."